On a day of action that could arguably be best categorised as frustrating – unless you’re either Claude le Roy or Congolese – to highlight a player from the only side not to acquire an AFCON point might seem perverse. Yet with individual spark lacking throughout Wednesday’s two fixtures, Gabon’s Levy Madinda provided a consistent source of invention. The 22-year-old’s endeavours ultimately went unrewarded as a frustrating evening for the Panthers cumulated in a determined Congo battling to a momentous first AFCON win in 41 years. Nonetheless, the Celta Vigo man was an undeniable bright spark in a Gabon side bereft of the attacking verve that won so many admirers in the defeat of Burkina Faso. 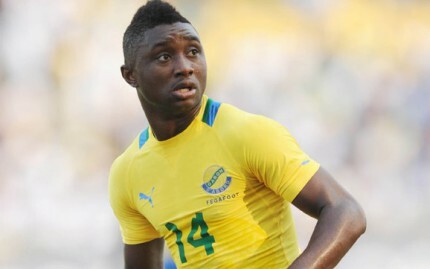 Madinda was synonymous with everything that the Gabonese did well in an attacking aspect. For example Malick Evouna’s 18th minute strike – that was only narrowly deflected to safety – was the result of a precise Madinda through ball, whilst with halftime in sight the Celta Vigo man came within inches of carving out an opening of genuine brilliance. Having wonderfully flicked the ball clear of a Congolese defender, Madinda’s resulting effort at goal sailed just fractionally wide. The second half was littered with further specks of Madinda magic, although the midfielder’s frustration began to visibly show as Gabon’s search for a route back into the game grew desperate. Two instances of Madinda opting to shoot when superior options were available prompted Jorge Costa to act, although without their chief orchestrator the Panthers failed to fashion a genuine opening through the game’s final furlongs. Madinda had offered glimpses of his ability in that earlier mentioned victory of Burkina Faso – a delicious ball providing the assist for Frédéric Bulot to double Gabon’s lead – and although on this occasion his creativity failed to bear fruit, if Gabon are to advance in this tournament then Madinda is likely to be a prominent figure.